Heading Southwest from Succor creek about 120-150miles Inland There once was a pay-to-dig site called the Buchanan Ranch. These Thundereggs are getting harder and harder to locate. There are several types availible from this spot with several colors of matrix. Some of these eggs display red colors caused by cinnibar inclusions. Desolation Canyon Thundereggs came from high in the Ochoco Mt's of Central Oregon north east of Prineville. All deposits are now in a strict area called Mill Creek Wilderness area and now closed to collecting. This deposit is located northeast of Richardsons passed a small town called Antelope. This deposit was short lived It was discovered as a road cut during a road building operation. Once word spread, every one of these eggs was dug out in no time. Specimens are very hard to acquire. 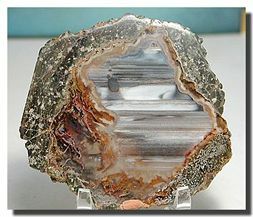 Utah has a well known deposit called the Dugaway Geode beds. They are located far out in the desert, East of Vernon Utah. These geodes are a lot like many of the Thundereggs We are showing here. They also come from our American West and go very well with the thundereggs. It's surprising how many people call these a Thunderegg. So we are including them in this group. This mine was also once owned by Leonard Kopcinski (Kop) It is several miles South of the Lucky Strike mine. It is now a private claim owned by a rock club from Western Oregon. The eggs are interesting and make a great addition to any collection. However it is difficult to find quality specimens from this mine. A lot of the eggs tend to be hollow with a unusual zeolite filled center. This bed was A few miles South from the Fallen Tree Mine in the Mill Creek Canyon this old deposit is on private land and there may or may not be any further mining. However the quality and beauty of these eggs are superb and at present they are very hard to find. This deposit is still active. But it seems eggs from this deposit are some of the most rare thundereggs to come across. The Frieda deposit is located on the banks of the Deschutes River north of Madras Oregon. At present this deposit is on private property owned by Dave Johnston. Near the same area as Richardsons Comes another deposit called Friend Ranch. The Friend Ranch is usually open twice a year during the Madras Pow-Wow and the Ashwood Rock Stock. The eggs are a bit different with a lot deeper and darker blue and black agate than Richardsons. These agate filled eggs have a fantastic range of colors. The eggs contain mosses, banded agate, fortification, plumes and some are also geodes. The Lucky strike mine is located approximately 35 miles northeast of Prineville, Oregon. Follow Highway 26 towards Mitchell, OR. Just before you reach the Ochoco summit, turn left on Forest Road 27 (2730). Follow 2730 until you get to road 200 where you will turn left again. (You will also see a sign indicating the direction to the Lucky Strike Mine on road 2730.). Once you turn left on road 200 go straight. You are only 2 miles from the Lucky Strike Mine. Leonard Kopcinski (Kop) is the owner. Both mines have been open to the public for over fifty years. This deposit is near the Oregon/Nevada Border. Near a town called McDermitt in Humbolt County. There are several Thunderegg deposits within this area. We know of 2 types, the Quinn River deposit and the Calico Deposit. We also have a red and yellow saginite from this area. Many miles east of Madras and Prineville's high desert country. Is the Wheeler County Area, Back of Hepner, Oregon. There is a well known deposit, known as Opal Butte. These Thundereggs can get very large and contain agate and jelly opal filled Thundereggs. Gem grade opals such as Contra Luz, or Precious opal is also found there. But the owner Dale Hewett says only about 1% of the opal mined is of gem grade. Some of the larger eggs also yield a brown and tan patterned material called turkey ether. Within the same area as Richardsons Comes another deposit called Pony Butte. We are uncertain if this ranch has been reopened or if its still closed down. The site was popular some 30+ year ago. About 40 miles northwest of the Prineville area, just north of Madras OR. on Hwy 97 is Richardsons Rock Ranch. Richardsons is probably one of the best known thunderegg digs. It has been around for many years not only as Richardsons, but part of Richardsons was also the old Priday beds. The Priday plume beds have not been worked for many years now so this particular material is very rare. This is a pay to dig ranch at a current price of $1.00lb. They offer several beds with many types of materials. They also have different agates and jaspers to dig too. On your way south down Mill Creek Canyon is a geological formation known as Steins Pillar. Many years ago in the area around this formation there were some small thunderegg deposits. This deposit is in the far eastern part of Oregon almost on the border with Idaho. this was and is a very large deposit of Thundereggs. These thundereggs can get large as in excess of hundreds of pounds! But most are average sized up to grapefruit sized. Interesting specimens, but not much color. they are mostly a clear and white agate mix. is another deposit just up the road about 1/4 mile from Valley View Mine. It takes allot of digging to find any great quality of eggs. But if you do hit a nice spot, the eggs can have very nice and different cores. This deposit is a few miles west from the Lucky Strike and Valley View Mine. In an area called Wild Cat Mountain. 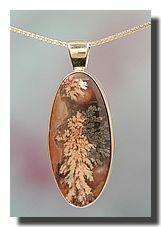 The Thunderegg bed is called White Fir Springs. This is a public claim owned by Crook County. It takes a lot of work to gather much quality. This material is unusual because the eggs contain a jasper core rather than the normal agate filled centers.